Did you know that world-class martial artist, Jackie Chan, once kicked someone in his head with his smile? True story. He learnt this trick from an old hermit living in Times-Square, when by accident Jackie bumped into him with his bold personality. Now if you want, you can now learn some of Jackie’s other techniques as well, as presented in this 90 minute documentary made in 2001. Say hello to Jackie Chan (hello! ), and his stunt team (hello again! ), as together, they will demonstrate to you a number of techniques that they have deployed over the years within Jackie’s movies. Now to help them illustrate this form of dynamic presentation in a more personable manner, Jackie and his men with show you - step by step - the ways in which this craft is utilized in a rough outline, before showing you how this was eventually captured on the big screen. GRASS ROOTS TECHNIQUES: In Jackie’s early years, he used a number of cinematic techniques that he has expanded upon over time. Fake Blood – breakable furniture – malleable weapons – wirework – pow-powder – close-arm combat – and multi-level combat – all of which are stratagems used to highlight a more bolder type of action. 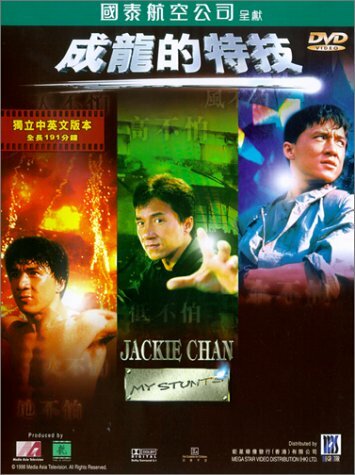 RECOLECTION OF FILM’S STUNTS: Jackie reminisces and presents a series of stunts that he was involved with, from films such as: (1) 'Police Story' - hanging from a bus by an umbrella - a tumble down the hill - and the long jump down a pole in a shopping center. And (2) 'Police Story 2' - crossing a busy road by jumping from one bus to another, before plummeting head first through a glass-plated store-sign. In each case - Jackie injured himself. FIGHTING ON FILM: Jackie commentates on a number of ‘behind the scene’s’ presentations, which captures how he works and why he works in a particular way. In additional to this, he stresses how he and his stunt team keep physically and mentally fit, as well as the precautions that they use to keep safe. Plus, there is a recount of one of the car stunts performed in one of Jackie Chan's film. THE JACKIE CHAN STUNT TEAM: Jackie’s Stunt team presents a jovial display of how they work, plus why they work. Also, Jackie talks about the innovative ways that he comes up with ideas for stunts, and how he delves into this ‘pot’ from film to film. GOOD FIGHT / BAD FIGHT: Jackie and the Jackie Chan Stunt team, show a number of ways how a choreographed routine can work or fail. No special effects required – not even in 'Rush Hour' – as footnoted. In closing, Jackie states how prospective film personnel should gage from filmic history, and then innovate upon it in there own style. 'Jackie Chan: My Stunts' is an informative video presentation about how the creative Kung-Fu King, Jackie Chan, does what he does best - perform! However, what have I learnt from watching this film? Hmmm? That Jackie can’t say ‘Umbrella’ and ‘Aluminium’ properly? Yes – that much is true – though I have to admit, that I have also learnt much-much more as well! For a start, I have learnt that Jackie Chan is an innovative genius – in how he has managed to amalgamate both old and new styles together, whilst adding a little bit of himself into the mix. Secondly, I have learnt that Jackie is a very dedicated and hard worker – as he has committed a large portion of his life in making films and improving techniques. Thirdly, I have learnt that the 'Jackie Chan Stunt Team' are all on a par with the great man himself – as likewise, they also have elevated and dedicated themselves to this filmic craft too. Fourthly, I have learnt that Jackie Chan must be one mixed bag of broken bones – because in each film has starred in, he has broken, twisted, or cracked something, whilst doing a stunt. And fifthly, I have learnt one very valuable lesson – don’t always believe what you see on screen. OK, so all that may be well and good, but does this film give us anything else? Yes – yes it does – as it gives us rare behind the scenes footage of numerous projects Jackie has worked on – it gives us an incite into the creative way that Jackie works – and it gives us a glimpse of a possible way forward for Jackie and his team too. Granted, I would have liked to have heard a little bit of gossip - you know - like if Jackie or any of his guys have been in a real fight before. Nevertheless, I am fairly positive that this isn't what this film’s intention was – it was about a man, his team, and his techniques used. Overall, ‘Jackie Chan: My Stunts’ was a well structured film, and has a clear narrative running thought out. It takes us on a journey of a man, his craft, and how these two components mix together in a personable way, whilst being very informative to boot. Personally speaking, I like to think of it as a Chinese masochistic exercise video - just with high-kicks instead of push-up – just with people jumping off of buildings instead of skipping – and just with explosions instead of leotards. Please note: This presentation is highly recommended for anyone who wishes to study movie techniques, loves Jackie Chan, or is inquisitive in a man and his work. A class act – and a class piece of work.